Every decade since the 1950s, Sight & Sound magazine has polled an international group of professional film critics to assemble lists of the greatest movies ever made. “Greatest films of all time” lists are notoriously contentious and usually somewhat arbitrary, but Sight & Sound is one of the few that carries real weight. 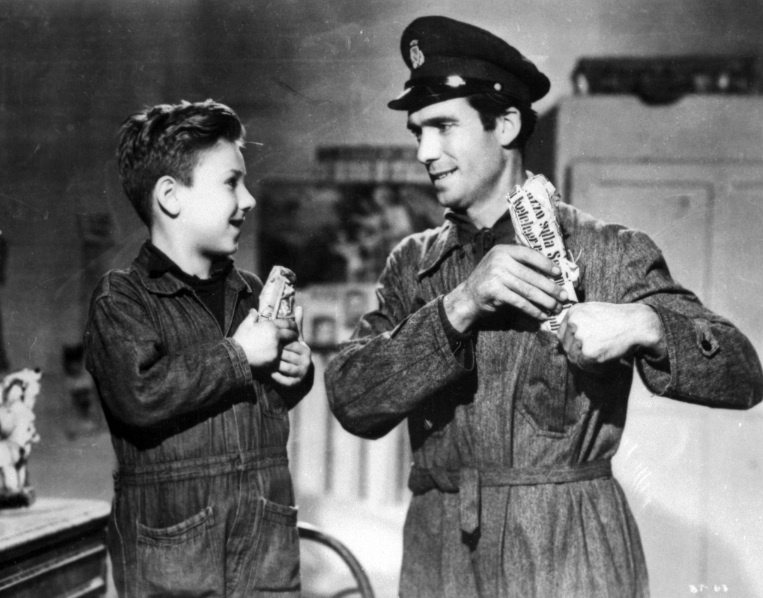 I first became aware of De Sica’s neorealist masterpiece when I was 14 or 15 (back when it was still called The Bicycle Thief in English), but I never got around to seeing it until a few days ago. So when I watch one of the “great films” for the first time, I just try to let it all wash over me and not think about it too hard until the credits roll. When Antonio gets a job hanging posters throughout the city, it’s the answer to his prayers, but he needs a bicycle to do the job, and he pawned his bicycle some time ago. So his wife, Maria (Lianella Carell), pawns their precious dowry sheets to get the money Antonio needs to get his bicycle out of hock, which allows him to do his job and earn a regular salary. Antonio’s joy is short-lived. As he’s standing on his ladder one day, pasting up a poster of Rita Hayworth, his bicycle is swiped from the wall where it is leaning next to him. The rest of the film follows Antonio’s journey through Rome with his son Bruno as they search for the bicycle, the bicycle thief, and the larger network of thieves who helped pull off the theft. When Bicycle Thieves ended, it left me with a mixture of sadness and exhilaration that I haven’t felt since the first time I watched Luis Buñuel’s Los Olvidados (1950). Bicycle Thieves is very different from Los Olvidados, and its tragedies are less earth-shaking, but it affected me in a way that cinematic death and destruction almost never does. The Italian neorealist movement started with Roberto Rossellini’s Rome, Open City (1945). Neorealism rejected Hollywood-style glamor in favor of nonprofessional actors working in real locations. Although neorealist films are shot in a verité style, none of them are documentaries. While De Sica’s actors were all appearing in a film for the first time, he was a seasoned director working with a professional crew. There is even a rainstorm in Bicycle Thieves that De Sica and his crew created themselves. As Antonio, Lamberto Maggiorani is not always likeable, but he is always relatable and always seems like a real person. Enzo Staiola, who plays his son Bruno, gives a deeply affecting performance. In the beginning of the film he’s a “little man,” and makes a lot of gestures and utterances that are funny because they seem so adult. But in the end, he’s just a child, and his wordless acting conveys so much. 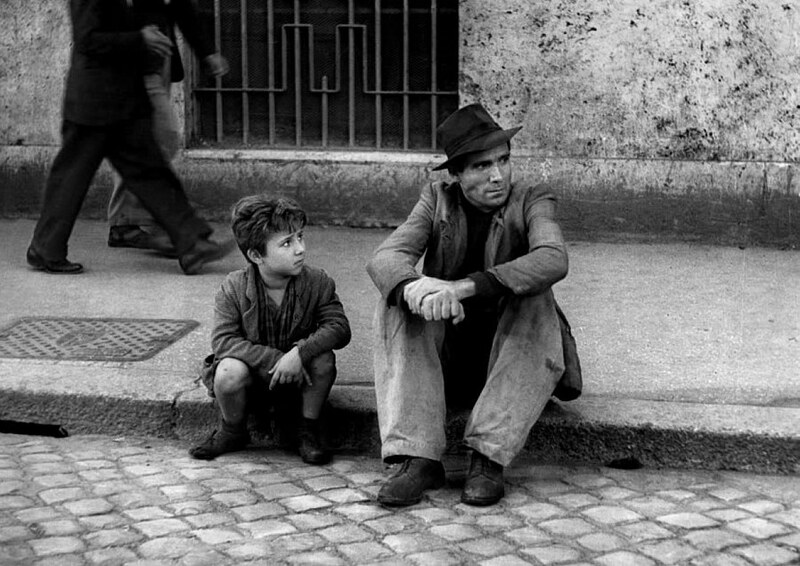 What impressed me most about Bicycle Thieves was the way it used grandness of scale to tell a story of individuals. When Maria pawns her family’s linen at the beginning of the film, we watch it slowly disappear into a huge warehouse of pawned linen. Each bundle tells its own sad story. 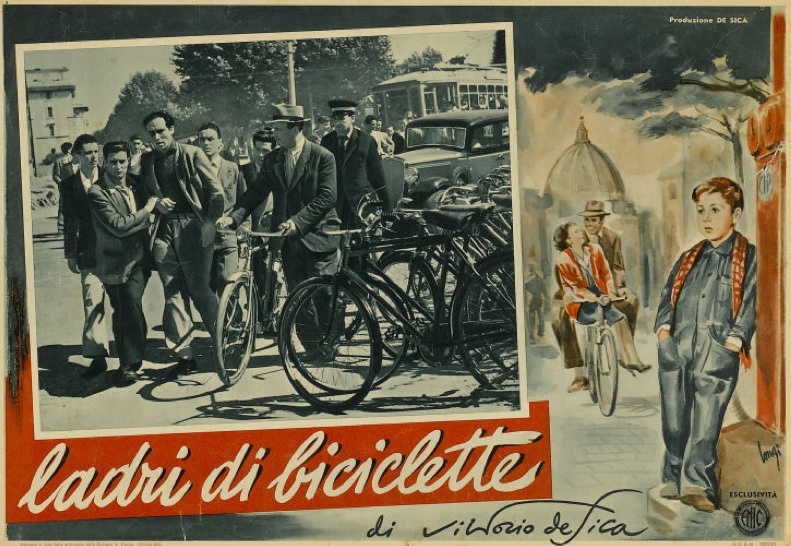 For the majority of the film, the number of people and bicycles in Rome is overwhelming. But we never stop thinking about that one, precious bicycle that Antonio and Bruno are searching for. The film ends with Antonio and Bruno disappearing into a crowd, just the way the linen disappeared into a warehouse of linen, and the way his bicycle disappeared into streets full of bicycles. The man and his son are just two tiny people in a sea of humanity, but when the film ended, their story meant more to me than I can express. Posted in 1948, November 1948 and tagged Ente Nazionale Industrie Cinematografiche (ENIC), Italian Cinema, Lamberto Maggiorani, Lianella Carell, Luigi Bartolini, Neorealism, Produzioni De Sica, Vittorio De Sica. Bookmark the permalink. If you only know Dean Stockwell as the craggy character actor who appeared in TV shows like Quantum Leap and Battlestar Galactica, it might be hard to believe that he was ever an adorable little 12-year-old boy. Well, he was. Even with a shaved head, which is how he first appears in The Boy With Green Hair, in the 1940s Stockwell was cuter than a barrel of baby pandas. 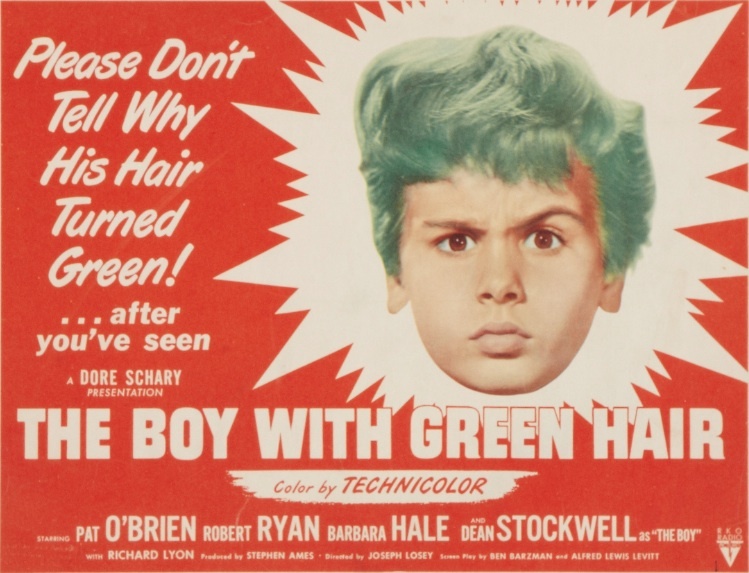 The Boy With Green Hair was Joseph Losey’s first feature-length film. It’s a lovely little Technicolor parable that opens with the song “Nature Boy.” (You know, the one about “a very strange, enchanted boy”?) Nat King Cole’s recording of the tune was a big hit in 1948, and was the #1 single in the United States for seven weeks. The melody of the song recurs throughout the film. It’s the story of a boy named Peter Fry (Stockwell), whose parents are dead, but no one seems to want to tell him. He’s shuttled around from home to home, always carrying a letter to show his foster parents (who he refers to as his “aunts and uncles”), although he’s not aware of the contents. Eventually he settles down with “Gramp,” a former vaudevillian and magician (and current singing waiter) played by likeable old Irishman Pat O’Brien. Peter thrives under Gramp’s care, feeling good enough about life that he no longer has to sleep with a baseball bat (though he keeps it on the floor next to him just in case). One day, however, his school holds a charity drive for war orphans. As Peter stands in front of a poster with a black and white photograph of an “Unidentified War Orphan,” he’s forced to confront the truth about his parents. They died in the London Blitz, and Peter can no longer deny the horrors of war. All of a sudden, war orphans aren’t just “over there,” they are right here, and he is one of them. Not long after this revelation, he wakes up one morning with bright green hair. Punks with brightly dyed hair turned heads in the 1970s, and it was even more unheard of in the 1940s. Peter is instantly ostracized by people who happily tousled his hair when it was brown. His teacher, Miss Brand (Barbara Hale), tries to make him feel OK about his condition. He may be the only kid in class with green hair, but there’s also only one boy who has red hair. But nothing stops the bullying and name-calling. The world is cruel to those who are different. 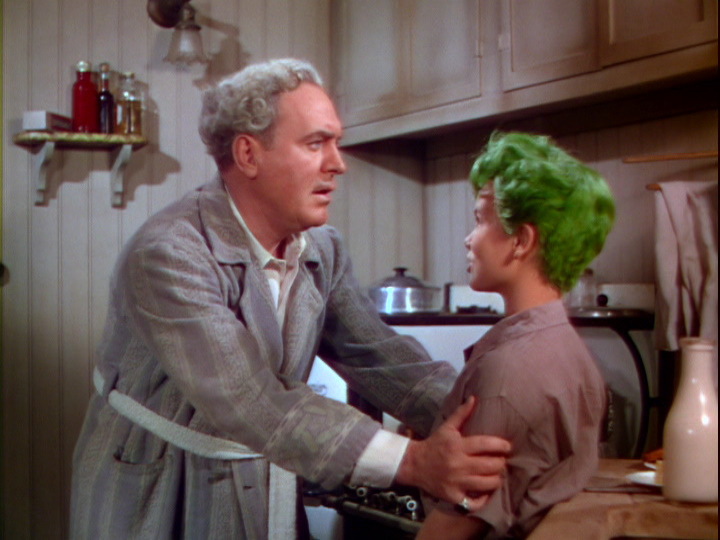 The Boy With Green Hair is told in flashback, as Peter sits in a police station with a shaved head, telling his story to kindly child psychologist Dr. Evans (Robert Ryan). 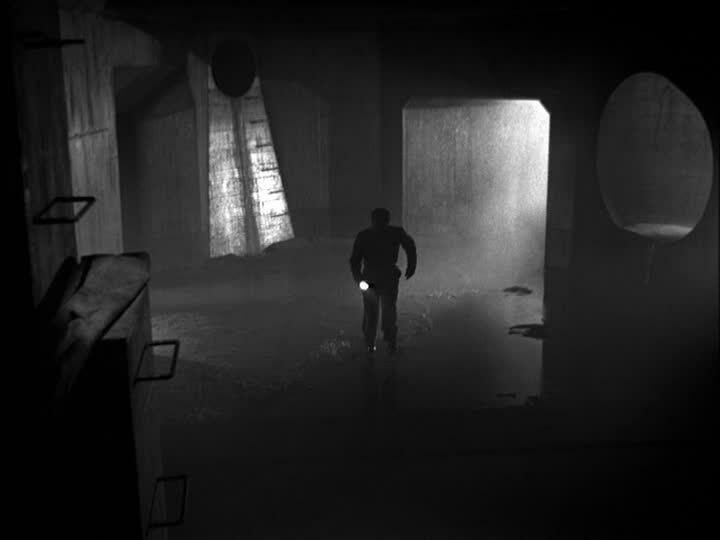 The message of the film might seem simple, but Losey’s direction and Stockwell’s assured performance elevate it to something haunting and strange that can’t be boiled down to a single slogan. It’s a movie that tells a serious, allegorical story about a child that other children can understand. Posted in 1948, November 1948 and tagged Barbara Hale, Dean Stockwell, Family Films, Fantasy, Joseph Losey, Pat O'Brien, RKO Radio Pictures, Robert Ryan. Bookmark the permalink. The Snake Pit wasn’t the first film about mental illness, but it’s one of the most significant. German Expressionist films like The Cabinet of Dr. Caligari (1920) and M (1931) are powerful films about mental illness, but they’re more horror films than they are dramas, and they don’t explore the day-to-day reality of life in mental asylums. Films like Maniac (1934) and Dead of Night (1945) are at least partially about “crazy people,” but again, mental illness is used as a horror trope, not a sad and difficult fact of life. The Seventh Veil (1945) and Spellbound (1945) both dealt with psychoanalysis, but they were designed to appeal to a public newly interested in Freudian theory, and didn’t touch on the facts of life in state mental institutions. In fact, the only movie I can remember seeing before The Snake Pit that really dealt with life inside a mental institution was Mark Robson’s Bedlam (1946), but the fact that it was both a horror film and a period piece gave audiences a comfortable sense of remove. The Snake Pit changed all that. It was based on the novel by Mary Jane Ward, who spent eight and a half months in a mental hospital. She was institutionalized for schizophrenia, which was possibly misdiagnosed. The Snake Pit was rejected by several publishers. When it was eventually released in a small print run in 1946 it became an unexpected bestseller and was reprinted many times. It was a novel, not a memoir, but it contained autobiographical elements and most of the characters were based on people Ward had known in Rockland State Hospital. The film version of the the novel stars bona fide superstar Olivia de Havilland in an unglamorous, makeup-free performance as Virginia Stuart Cunningham. The film drops us into Virginia’s schizophrenic experience in media res. She’s sitting on a park bench, looking up at the sun shining through the branches of a tree. On the surface, it’s idyllic, but we soon notice that her clothes are threadbare and her nylons have a run in them. Her voiceover conveys how confused she is about where she is and what she’s doing there. Her fellow inmate, Grace (Celeste Holm), is more aware of what’s going on and guides Virginia into the group of women when the noontime break is over. They are shuttled inside by the nurses, and Virginia’s surroundings resemble a prison. There are even iron bars. This is a major theme in the film. Virginia is locked in a prison of her mind’s own making — her mental illness. But she is also locked in a very real prison — a mental institution where electroshock treatments, cruel staff, and harsh conditions are the norm. The one bright spot for Virginia inside the institution is Dr. Mark van Kensdelaerik (Leo Genn), who is only ever referred to as “Dr. Kik,” because Americans find his surname too hard to pronounce. Dr. Kik has a picture of Freud hanging in his office, and believes psychoanalysis is the key to Virginia’s recovery. I had some uncharitable things to say about Leo Genn in my review of Mourning Becomes Electra (1947), but that was more about his miscasting than anything else. He’s perfectly cast in The Snake Pit, and his performance is wonderful. His Freudian explanation of Virginia’s condition is a bit too neat, but audiences in the 1940s liked their stories with every T crossed and every I dotted. The other man in Virginia’s life who cares for her is her husband, Robert Cunningham (Mark Stevens), but there’s very little he can do for her. Through a series of heartbreaking flashbacks, we see her grow increasingly fearful of him and confused about reality. 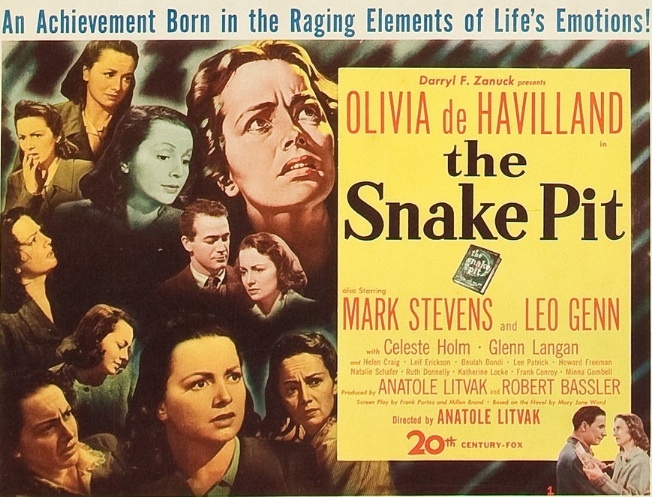 The Snake Pit was directed by Anatole Litvak, a Ukrainian director who became an American citizen in 1940. 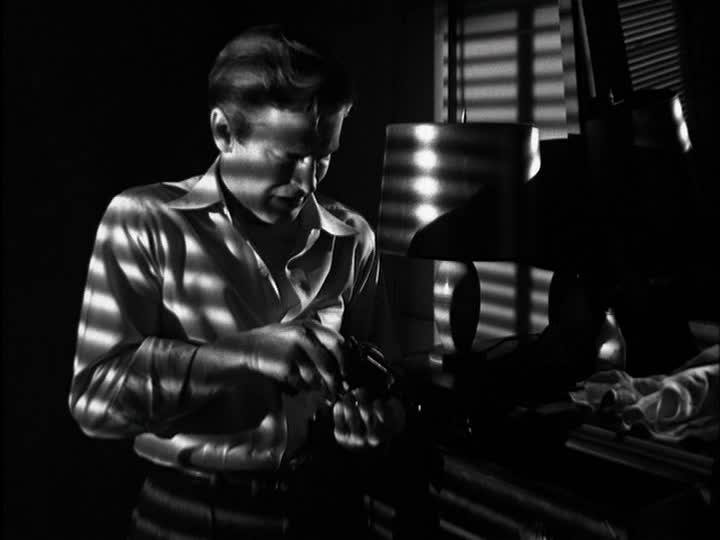 Litvak’s previous couple of films, The Long Night (1947) and Sorry, Wrong Number (1948), were both beautifully crafted, but they weren’t as powerful or as resonant as The Snake Pit. The scene in which the title of the film is realized visually is one of the most haunting I’ve ever seen. Litvak’s direction is wonderful, but none of it would work without Olivia de Havilland’s phenomenal performance. She was nominated for an Academy Award for best actress, but she lost out to Jane Wyman for her role in Johnny Belinda (1948). The Snake Pit actually had an extremely high portion of its budget devoted to hiring seasoned and professional actors, since Litvak wanted even the small roles in the film to be convincing. It paid off. 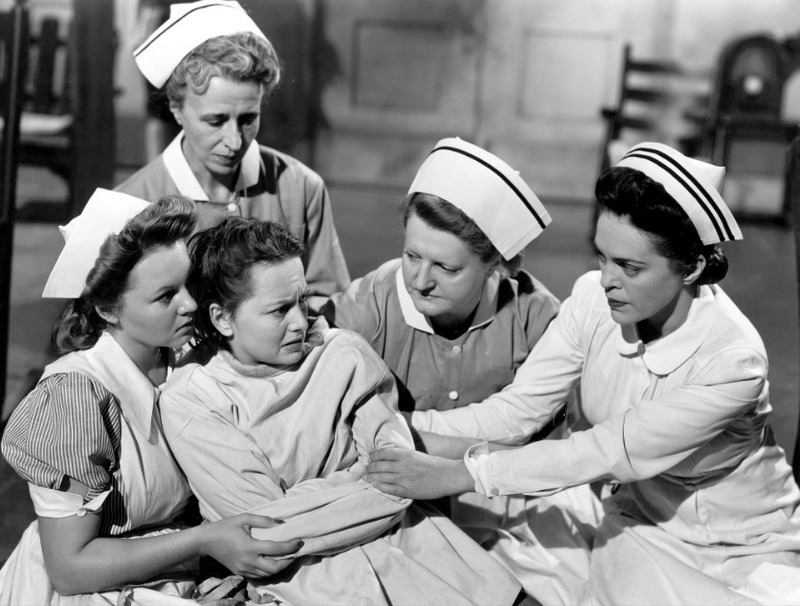 In addition to de Havilland’s nomination, The Snake Pit was nominated for Academy Awards for best picture, best director, best screenplay, best score, and best sound recording, which is the only Oscar that it actually won. Posted in 1948, November 1948 and tagged 20th Century-Fox, 21st Academy Awards, Anatole Litvak, Beulah Bondi, Celeste Holm, Helen Craig, Leo Genn, Mark Stevens, Mary Jane Ward, Mental Illness, Olivia de Havilland. Bookmark the permalink. Joan of Arc was always a force to be reckoned with. In life, she had heavenly visions, led the French army to several victories against the English during the Hundred Years’ War, paved the way for Charles VII to become King of France, and was tried for heresy and burned at the stake in 1431. When she died, she was only 19 years old. In death, she exerted a powerful influence over the imaginations of artists and writers. 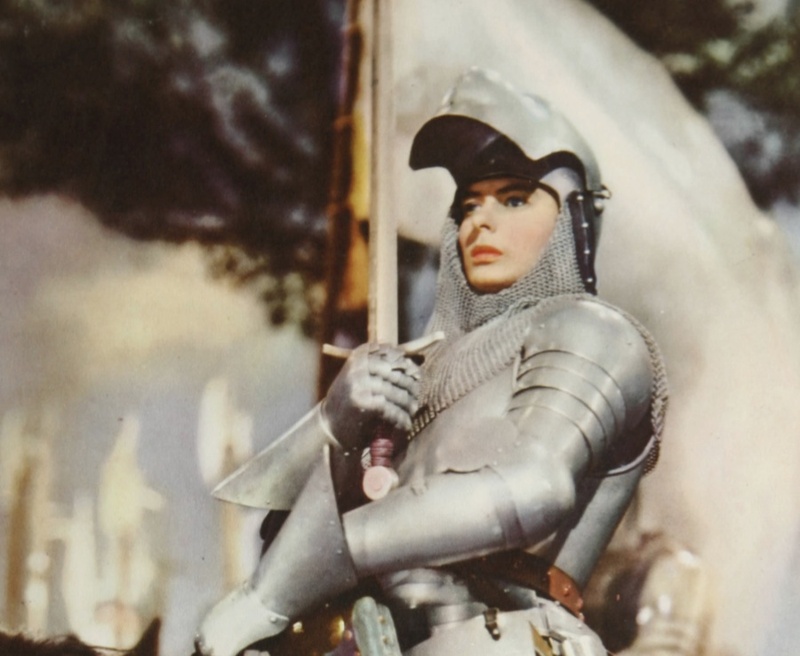 From Shakespeare’s largely unflattering portrayal in Henry VI, Part 1 to Mark Twain’s largely forgotten historical novel Personal Recollections of Joan of Arc, the Maid of Orléans was a devil to some, and a saint to others. Over time, the English decided to stop caring so much, and she came to be seen by more and more people as a holy figure. In 1920 the Catholic Church decided to make it official, and canonized her, which reignited interest in her life. Her trial for heresy, which was held in 15 sessions from February 21 to March 17, 1431, was exhaustively recorded. Most fictional portrayals of Joan of Arc, like George Bernard Shaw’s play Saint Joan (1923), drew from these official records. Maxwell Anderson’s play Joan of Lorraine opened on Broadway on November 18, 1946, and played for 199 performances at the Alvin Theatre. The last performance was on May 10, 1947. The original production starred Ingrid Bergman as Mary Grey, an actress playing Joan of Arc who struggles with her director, Jimmy Masters (played by Sam Wanamaker), over how Joan should be portrayed. 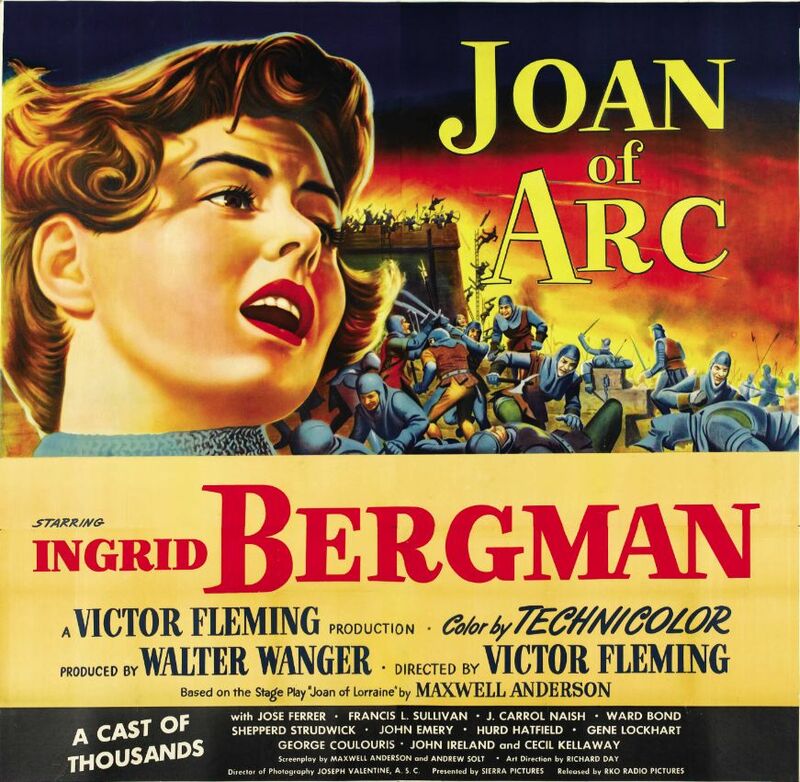 Joan of Lorraine was the basis for the 1948 film Joan of Arc, which also stars Ingrid Bergman, but the “play within a play” concept was jettisoned in favor of straight historical drama. Much of Anderson’s original dialogue was retained, however, with additional scripting and added characters by Andrew Solt. Joan of Arc was the last film that Victor Fleming directed. The man who directed The Wizard of Oz (1939) and Gone With the Wind (1939), as well as many other memorable films, died of a heart attack on January 6, 1949. He was 59 years old. While it might not be as fondly remembered as some of his other films, it’s still a pretty good one to go out on. It’s a big, sprawling, Technicolor costume drama (although there is a cut version that is just 1 hour and 40 minutes, the original cut of the film is 2 hours and 25 minutes long). Most importantly, Joan of Arc features a brilliant lead performance by Bergman. Most of the other actors are pretty good, especially José Ferrer (in his first film role) as the Dauphin, later Charles VII. With a cast of thousands, however, there are bound to be a few duds, and there are, although Ward Bond, whom I more closely associate with westerns than European historical dramas, was better than I was expecting. John Ireland? Not so much. Joan of Arc is also heavy on dialogue and light on spectacle. With the film looks great, there’s only one big battle scene, and it doesn’t come close to matching similar scenes that Fleming directed for Gone With the Wind. While Joan of Arc is by no means a bad film, without Bergman’s performance it would lose most of its impact. It’s certainly worth seeing, but if you’re only going to see one film about Joan of Arc in your lifetime, it should be Carl Theodor Dreyer’s silent film The Passion of Joan of Arc (1928), which stars Maria Falconetti in one of the most hypnotic film performances of all time. With spare sets and simple costumes, Dreyer achieves effects Fleming could only dream of. Falconetti’s performance in The Passion of Joan of Arc walks the fine line between madness and mysticism. Religious faith is a tricky thing to depict on film, but Dreyer’s film is one of the few that gets it exactly right. The fiery finale of Fleming’s Joan of Arc is powerful, too. And as far as visual depictions of religious martyrdom go, I think both films are more powerful statements than the geek-show excesses of The Passion of the Christ (2004). In the run-up to the 21st Academy Awards, Joan of Arc was the first film to receive seven nominations without a nomination for best picture. Ingrid Bergman was nominated for best actress, José Ferrer was nominated for best supporting actor, Hugo Friedhofer was nominated for best dramatic or comedy score, Richard Day was nominated for best art direction in a color film, and Frank Sullivan was nominated for best editing. The film won in two categories; Joseph Valentine, William V. Skall, and Winton Hoch won the Oscar for best cinematography in a color film, and Dorothy Jeakins and Barbara Karinska won for best costume design in a color film. Posted in 1948, November 1948 and tagged 21st Academy Awards, Ingrid Bergman, J. Carrol Naish, Joan of Arc, José Ferrer, RKO Radio Pictures, Victor Fleming, Ward Bond. Bookmark the permalink. Blood on the Moon is an RKO western directed by Robert Wise. It’s based on Luke Short’s novel Gunman’s Chance, which was originally serialized in The Saturday Evening Post in 1941. I’ve only read one of Luke Short’s western novels (he wrote more than 50), but judging by it and the two films I’ve seen that were based on his work (this one and André de Toth’s 1947 film Ramrod), dense plotting, terse dialogue, and three-dimensional protagonists were some of Short’s trademarks. Like most protagonists of westerns in the ’40s and ’50s, the protagonists of Blood on the Moon and Ramrod are on the side of the angels. But they’re more interesting than the cookie-cutter heroes of countless B westerns. Not so much because they’re complex people, but because they’re believable people who exist in a complex world. First-time viewers of both Ramrod and Blood on the Moon will likely have a little difficulty figuring out who the “good guys” and the “bad guys” are right away, and who’s telling the truth and who’s lying — at least for the first couple of reels. The hero of Blood on the Moon — Jim Garry — is played by Robert Mitchum. Garry is a solitary cowpoke with a small herd. He’s passing through open country when his herd is run off in a stampede. Rancher John Lufton (Tom Tully), owner of the Lazy J Ranch, apologizes and offers to reimburse Garry for the outfit he lost. Even so, their exchange is tense. Lufton doesn’t trust loose riders, since he’s feuding over grazing land with Jake Pindalest (Frank Faylen), a newly appointed Indian agent who’s thrown Lufton off the reservation grass, and stopped Lufton from supplying the tribe with beef, even though he’d done so for years. “I’ve been mixed up in a lot of things, Tate, but up till now I haven’t been hired for my gun,” Garry says. 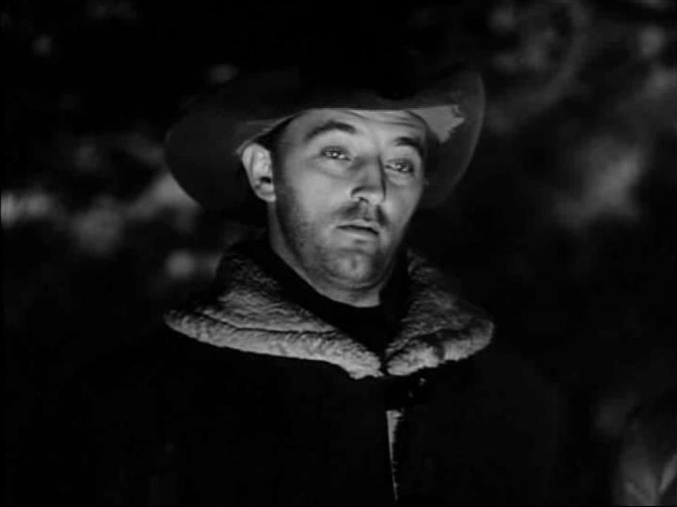 Mitchum is perfect for this type of role. He was a laconic actor who barely ever changed his expression, but he could suggest depths of emotion with his eyes. 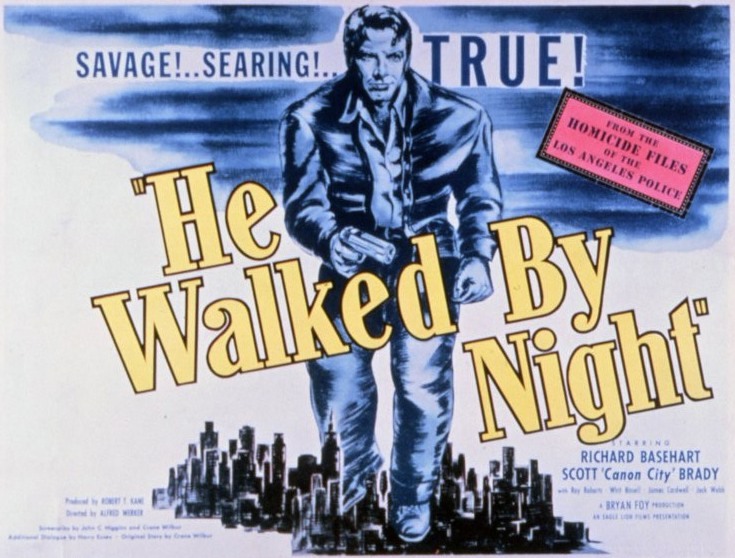 I’ve seen him in run-of-the-mill westerns like West of the Pecos (1945), and he’s fine in them, but he did his best work in dark, noirish westerns like this one and Raoul Walsh’s Pursued (1947). Robert Wise, the director of The Body Snatcher (1945) and Born to Kill (1947), keeps Blood on the Moon moving at a brisk, tense pace. The cinematography by Nicholas Musuraca is full of darkness and shadows. It’s not full-on “noir” like James Wong Howe’s cinematography for Pursued, but Blood on the Moon still spends a lot of time in darkened saloons, lonely country at night, and the streets of a frontier town after dark. Even the exterior scenes that take place in daylight have a sense of gray desolation. The cast is really great, too. I like seeing Barbara Bel Geddes in just about anything, and I especially liked her as one of Lufton’s two daughters, Amy. (Phyllis Thaxter plays the other daughter, Carol.) Square-jawed, gruff-voiced tough guy Charles McGraw plays a gunhand named Milo Sweet who wears one of the sweetest buffalo coats I’ve ever seen. As a homesteader named Kris Barden, Walter Brennan plays essentially the same character he played in every movie he was ever in, but he finds depths of emotion in his character that he didn’t always get to explore as a comical sidekick. And I always love seeing Tom “Captain Marvel” Tyler in any western, even if he was a pretty wooden actor. 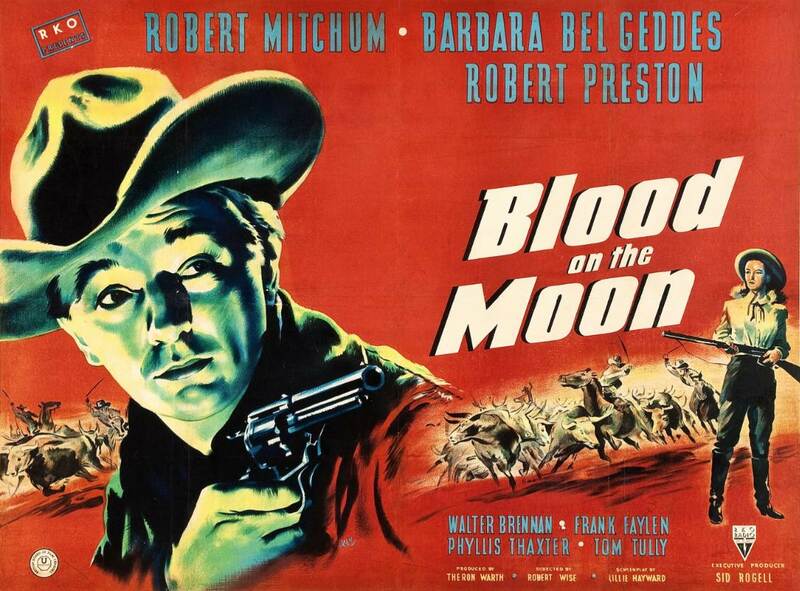 In Blood on the Moon, he appears just long enough to be effective — in a tense showdown with Mitchum that’s 10 times as exciting as most western showdowns that have more traditional outcomes. The tough, no-nonsense screenplay of Blood on the Moon is by Lillie Hayward, from an adaptation of the novel by Luke Short and Harold Shumate. Blood on the Moon won’t ever be counted as one of the all-time great westerns, but the western was a damned busy genre at the time of its release, and it’s a cut above the rest. It holds up to multiple viewings, and presages the many ways in which the genre would mature in the 1950s. Posted in 1948, November 1948 and tagged Barbara Bel Geddes, Charles McGraw, Frank Faylen, Lillie Hayward, Luke Short, Phyllis Thaxter, RKO Radio Pictures, Robert Mitchum, Robert Preston, Robert Wise, Tom Tully, Tom Tyler, Walter Brennan, Westerns. Bookmark the permalink.